Other names: Chinese wolfberry, wolfberry. Gojiberry is a native of China and widely used in Chinese medicine there. It is said to possess anti-aging properties. So it is in use in China since thousands of years. During the past 5-6 decades, information about the health benefits spread to other parts of the world. The demand for its fruits and bark is increasing by leaps and bounds. So this plant has now emerged as a wonder herb. Efforts, therefore have begun in other parts of the world to cultivate it. 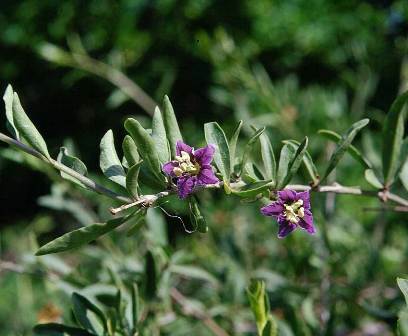 A thick shrub upto 1.6~2.0m high, diameter of single main trunk reaching10cm to 20cm when cultivated; wild growing shrubs relatively smaller in size. Single leaves grow cross on short branches, fasciation , needle shaped leaves, complete edge, no hair, length 2~3cm, width 2~6cm. Flower fasciation, on short branches, calyces cup shaped, chaplet funnel shaped, color shallow purple or purple-red. Seeds 25 to 50, flat kidney shaped, 2.5mm long, 2 mm wide, yellow. Gojiberry fruits taste like raisins with a slight suggestion of tomato. They can be eaten raw or could be cooked. The Chinese make soups out of this berry and also brew it into a wine. The leaves are also cooked as a vegetable. The fruits are considered as one of the richest natural sources of nutrients. They contain beta-carotene, Vitamin C, Vitamin B1 and B2, in addition to a number of other vitamins, minerals, antioxidants and amino acids. Gojiberry contains a lot of the carbohydrates, protein, fat and dietary fibers needed by the body. Hundred grams of the processed berry contains 370 calories. 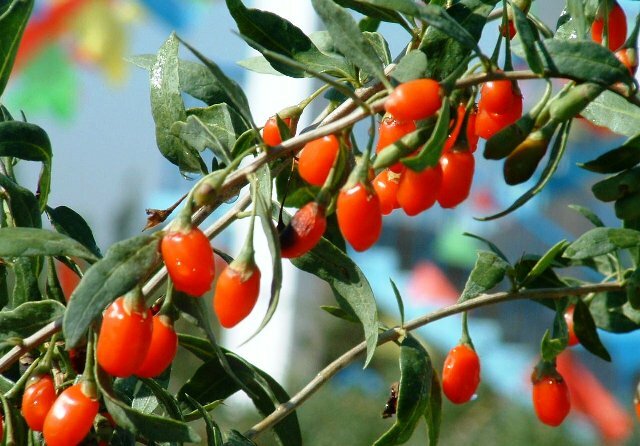 Bark of gojiberry plan has been a favorite medicine with the traditional Chinese system of medicine. It is claimed that it contain several valuable and important properties and are useful in various treatments and health improvement programs. These include improvement of the immune system, improvement of the eyesight, protection of the liver, improved blood circulation and increased sperm production. The bark has also been used in traditional medical systems as a sedative and painkiller and to treat inflammation, skin irritation, anemia, cough and nose bleeds. Some studies also suggest that it could be useful in the treatment of cancer, although more clinical trials would be needed to establish this claim. The barks can be eaten raw or taken as a juice or with tea. Gojiberry fruits can also be taken on daily basis for general health. Due to the high nutrient and anti-oxidant content of gojiberry fruits, there has been considerable rise in the demand for gojiberry all over the world. In fact, it is expected to turn into a billion dollar crop soon. Therefore efforts are being made to start cultivation of gojiberry everywhere. 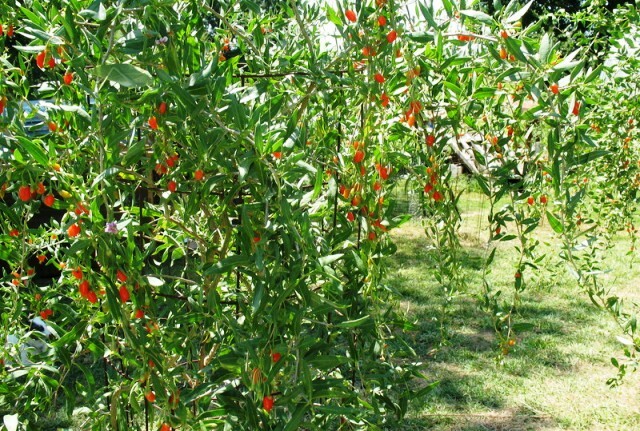 Though precise information on the cultivation techniques for growing this plant outside China, do not exist, but the trials carried out at various places indicate that gojiberry prefers hot and dry climate with warm days and cool nights. And the more this difference is, the better it will be for plant. This plant seem to be quite hardy and can thrive even on poor and dry soils. However, if the soil is good and enough care of plants is taken, then there is a significant increase in yield. Plants can be raised from seed as well as from cuttings. However, experience indicates that plants propagated from cuttings perform better. Bearing starts in 2-3 years. Five year old plants start bearing a full crop. Gojiberry can also be used as a hedge and as a stabilizer for sandy banks since it has a good root system and grows on sandy soil.